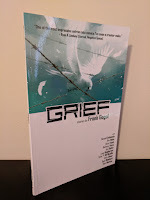 GRIEF: stories by Frank Gogol - I have a confession to make: despite my love of comics, until very recently (we're talking the last month and a half or so), I have not been very successful in supporting indie comics. Caveat: I personally don't consider titles from Image independent comics. Sure they are all creator owned properties, but Image is more than the big fish in the small indie pond, they're more like the the kid who has graduated from the kid's table at family gatherings. And that is my long way of introducing this collection of stories by Frank Gogol from Comics Experience and Source Point Press.